Antunovic presents during the "Sport and Gender" panel. Bloggers on women’s sports blogs appear to view fandom differently than common perceptions of fan behavior, said Dunja Antunovic, a researcher with The John Curley Center for Sports Journalism at Penn State. Bloggers on Women Talk Sports and BlogHer perceive sport often through a participatory perspective rather than an observatory lens, Antunovic said. In other words, instead of following teams many of the bloggers on these websites enjoy sport in terms of well-being and as a livelihood. 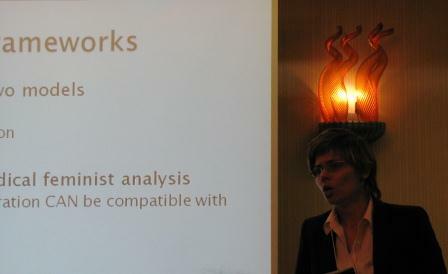 Antunovic and her research colleague Marie Hardin analyzed the bloggers’ profiles to gauge their views on sport and fandom. Many of the bloggers were not rabid fans of teams and did not focus on the more aggressive actions of fandom. They were more fans of the sports themselves and in terms of women’s sports, they worked on “bringing visibility” to them, Antunovic said. Overall, the bloggers saw sport's purpose to be positive, inclusive and build relationships, she said. But why do women need a separate space to discuss sports? Preliminary research by the University of Tennessee’s Traci Yates can perhaps help to answer this question. Yates interviewed four women NFL fans to gauge their experiences as fans. A common theme among these women was the fact they had to verify their sports credentials, Yates said. Male sports fans often “tested” the women’s sports knowledge and acted as if they are the gatekeepers on determining genuine levels of fandom. One of Yates’ interview participants expressed embarrassment at this type of questioning and the overall challenge to her quality as a fan. To that end, another one of Yates’ participants talked about how she had to change her language style to fit in when she watched sports among men. She never talked that way except in that sporting context among men, indicatinf that perhaps sports fandom is defined by aggressive men. Both studies also more broadly discussed working to change the definition of fandom; that there should not be “fandom” and then a women’s style of fandom. Rather, the definition needs to encompass a wider segment of the population – one that likely includes the majority of male sports fans, who are people who like sports but are not the intense, face-painting, tribalistic individuals commonly portrayed as the typical sports fan. What should the discussion be on performance-enhancing drugs? How do female athletes want to be portrayed? Does the government need to protect NFL players? Is the regulation of celebrations in sports part of a larger battle? Is more required of black male superstar athletes?